Zaouiat Cheikh is a small town somewhere along the road between Fès and Benin melal. It’s in the plains of the middle Atlas mountains. We had a little coffee break here, and I took the opportunity to cross the street and make this drawing (in 16 minutes). As you can see in the real picture, I adapted reality a bit, the area was actually more hilly than the picture suggests, so I changed the flat horizon for a slight hill. I also changed a few walls in front, regarding colour and texture, because the drawing needed balancing. 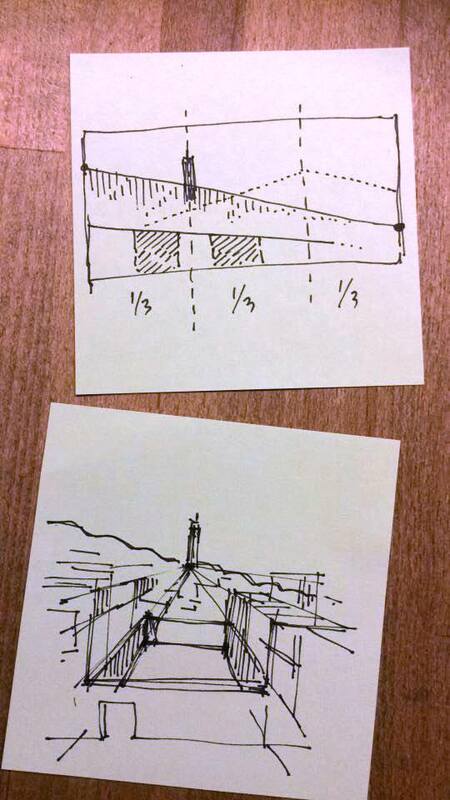 In a discussion on facebook I made this analysis of the compositional properties of the sketch (the top vignette). You see now why I choose to make the little hill, and why I changed a grey wall into red (on the left side). The bottom vignette is an alternative composition that I could have chosen for that same scene, but I found the top idea to be more consistent with how I “felt” about the area. The bottom sketch would have looked totally different. While drawing, I did not have time to ponder about all these features. But before starting, I did take a minute to determine what I would draw, and how I would treat the scene. The rest came automatically. Once I started, the decisions were simply inevitable.